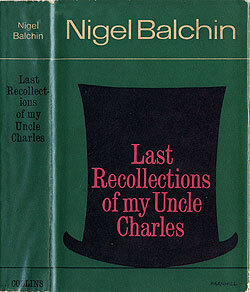 Synopsis: Balchin serves up seventeen linked stories, the link being the narrator, Uncle Charles, a “professional guest” and smoking-room raconteur. Highlights include Mine Host (about a hotel run apparently for pleasure not profit), Cards for the Colonel (in which Charles is forced to plot the death of his World War One C.O.) and Patience (card-game shenanigans on the French Riviera). Context: Many of these stories had already appeared in newspapers and magazines by the time they were brought together for this collection. The last tale in the book, Among Friends, was the basis for the 1955 Boulting brothers’ film Josephine and Men, which was scripted by Balchin. ITV broadcast a number of the stories in 1967, with Raymond Huntley in the title role. Verdict: The first two stories are excellent, as is Among Friends, which is the best story here and the one that most closely resembles the Balchin style of the novels (indeed it could perhaps have been expanded into a novel). Elsewhere, the quality is variable and there are perhaps a few too many stories that are overly concerned with the mundane. Nevertheless, this is a great volume to dip in and out of. Availability: Not the easiest of Balchin’s books to find, but an Internet search should reveal at least one or two copies.